Njanananu Party malayalam movie directed by Snoba Alex will have Tony, Kalasala Babu and Kumarkam Reghunath in lead. Produced by Alex Thankchan under the banner of Seba & Feba visual media, the movie is blessed with the presence of Vishnuprakash, Manu Varma, Poojapura Ravi, Venu Ambalapuzha, Njakkadu Rajan, Krishna Bharathi, Ponnamm Babu, Anila Sreekumar, Kulapulli Leela, Bindhu Menon, Anil Aravind, Anand Anil and Reshma Babu. The screenplay and dialogues are safe in the hands of Alex Thankchan. 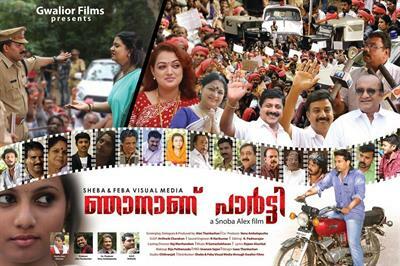 There had been a number of movies released in malayalam which set in the background of Kerala politics. Yet another movie based on political rivalry is gearing up for release. Titled 'Njananu Party', the movie directed by Snoba Alex tells an interesting story with roots into politics and family relations. Krishnakumar is a most popular and well liked minister in the state. Living with his wife Ragini and two children, his family life is filled with displeasure. During his college studies, Krishnakumar was in love with a girl. But in the later stage of his life, he got married to a Ragini with whom he found hard to blend his personal happiness. Narayanan Pillai, Krishnakumar's father is a strong is political figure, who is much popular among the political circle. Even though Krishnakumar wished to keep him away from politics, due to the high influence from his father he became active in politics. Krishnakumar became very close to the people and in a very short span of time became popular and rose to the position of state minister. Krishnakumar proved his mettle as a minister, but his family life collapsed due to various reasons. The challenges faced by Krishnakumar forms the crux of the movie. Tony who had been keeping his presence alive both in television and movies for the past 20 years will give life to Minister Krishnakumar. Kalasala Babu would enact the role of Narayanapillai. The healthy relationship of a father and son, which later turns to jealousy and later to enmity is the prime theme of the movie. Bindhu Menon would be seen as Ragini while Kumarakam Reghnath would perform as Chief Minister Reghunath. Ponnamma Babu presents Raji Pillai in the movie. Vishnuprakash, Manu Varma, Poojapura Ravi, Venu Ambalapuzha, Njakkadu Rajan, Krishna Bharathi, Ponnamm Babu, Anila Sreekumar, Kulapulli Leela, Bindhu Menon, Anil Aravind, Anand Anil and Reshma Babu will also be seen in the movie. 'Najanu Party' is produced by Alex Thankchan under the banner of Seba & Feba visual media. The screenplay and dialogues are safe in the hands of Alex Thankchan. For the lyrics of Rajeev Alunakal, the tunes are set by R Somashekaran. Hirthwik Chandran stays behind the camera as the cinematographer.